Who's Copied The Keys to Your Business or Home? At Bob's Master Safe and Lock Service, we pride ourselves on offering the finest products to our customers. Among these products are the high security locks that we sell. These locks provide for the ultimate in key control. The locks are patented to prevent unauthorized distribution of key blanks and duplicate keys are only made after a positive identification has been made of the authorized users of the system, and in the case of DOM and Abloy, using special ID cards that we issue. Duplicate keys can only be made by us, and only you can authorize the keys to be made. The DOM and Abloy locks are pickproof and highly drill resistant. Businesses can save hundreds of dollars in rekeying costs by installing high security locks and maintaining control of the keys. Since duplicate keys can't be made without the authorization of the authorized user, it is no longer necessary to change locks each time you terminate an employee or lend out a set of keys. Homeowners can feel confident that the set of keys that they loaned out to a neighbor haven't been copied and passed around the neighborhood. We offer high security locks from three manufacturers: Medeco, Abloy, and DOM. By offering three manufacturers, we can provide a high security solution for every requirement. Medeco x4 interchangable cores will fit into Best, Stanley, Falcon, Arrow, Keymark, Oak, and other small format interchangable core format locks. This allows you to only purchase the core itself and keep your existing hardware. Permission for copying Medeco x4 keys is provided by identification and signature verification at the original locksmith provider, a signed authorization card is not issued. These locks are not designed to offer a high level of protection against picking or the use of a bump key, the main focus is key control. 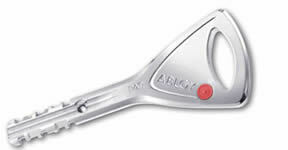 Abloy Protec2 cylinders will fit a wide majority of locks and applications on the market. The cylinders are UL listed, and highly drill resistant. Bump keys and lock picks do not work with these locks due to the design of the cylinder. DOM cylinders offer the ultimate in key control. DOM locks are best suited where the ultimate in key control is required. Specialized equimpent which is password protected by the manufacturer is required to cut the keys, and keys can only be duplicated at our Fishers location. These cylinders offer a 10 year manufacturer's warranty.